Because of their intelligent modular design, our triple.s Umsteiger Plus 2000 and Umsteiger Plus 2000 Light railway platform systems are a functional and economic innovation and go to the heart of the topic of railway platforms. 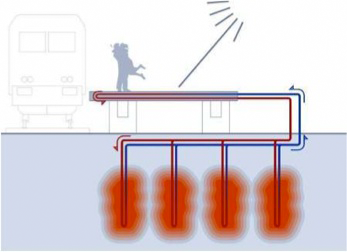 The comply with the regulations and meet the requirements of transport companies for railway platform facilities in every respect, achieve the difficult balance between intelligent economy and sustainable economy, and they enable additional innovation with the optional integration of the triple.s surface heating system. Compared to the traditional construction method they require only half the time for construction and you only need to take into account minor disruptions to railway operations, that is, there will be no need for replacement bus services or reduced-speed stretches. 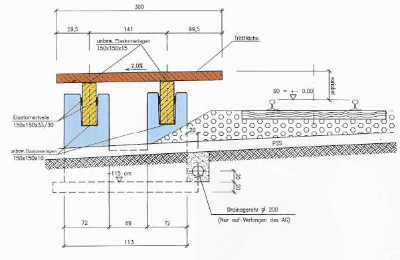 The railway platform surface is positioned with a 2% inclination and the pavement (railway platform slabs) can be chosen individually. The surface water can drain off via the drainage channel or into the embankment vegetation. Because of the design it is not possible for movable objects, such as pushchairs and baggage trolleys, to roll off the platform onto the track. After the draft and implementation planning, we carry out production of the prefabricated parts. Because of the modular design of the system, and the preparations that are already made during manufacture of the modules for all further equipping and requirements, the construction and installation time is extremely short. Specialised services can therefore be performed immediately as installation progresses. The upgrading of an existing railway platform system is possible without blocking and hindering the tourist traffic or railway operations. The dismantling of existing construction elements is carried out in a non-destructive manner, the height of railway platforms can be changed, and necessary pieces of equipment can be installed later without great effort. The perfect supplement for both the Umsteiger Plus 2000 and Umsteiger Plus 2000 Light railway platform systems is our triple.s geothermal surface temperature regulation system. Our railway platform systems are already designed to accommodate this useful supplement and therefore allow cost-effective and easily and perfectly integrable surface temperature regulation. The surface temperature regulation system ensures passenger safety and comfort in winter and also trouble-free transport operations. 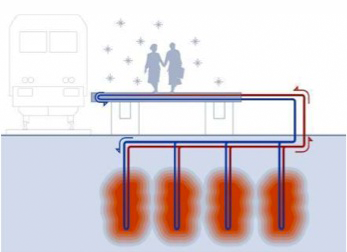 Particularly strong synergies result from the combination of triple.s surface temperature regulation and triple.s point heating, since the thermal energy of the point heating system can also be immediately used to heat the railway platforms, access routes and parking areas.